I was writing recently about how I don't think I am appreciating the 'norm' in my life any more. Which, for the most part is true. I do however never forget how much I love to drive here. Where I live in Nairobi, traffic is really not a problem. I drive around in my Surf like I have somewhere to go. Winding through the valleys, with the sun (more often than not) is shining and I think..I am so lucky. 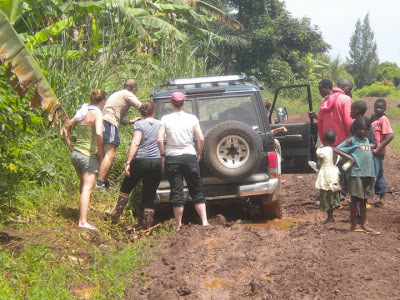 Hey-we all like adventure...until you get stuck in the mud! Ah well, I learnt from the good old Prado days...and bought a spade...which I now keep in my boot...you never know. I think of the flat highways in Kuwait, where I drove at 120km per hour, in the slow lane. Eeeeeek! I used to drive a small Peugeot (say it-Peugeot...is there an 'r'? Jo...no). I think I may not fit in one again. I might just have to plant a tree or two here, to offset my carbon footprint...just so I can get a 4x4! The other night at a party, a friend was telling her 'worst day in her life' story. Which although might not sound that bad to some, sounded pretty traumatic. It was the day of her driving test...in Nairobi. Now, I have friends who have been to the government building and $100 later have walked out with their papers...never having to sit in a car. But this friend wanted to do it properly. She arrived at the test centre at 6 am ,when requested, arriving before the instructors. She then had to do a lot of waiting around, lining up in queues, playing on her blackberry, until it was time to get in the car...with the 3 other candidates. She didn't leave until 8.30pm, but at least she did have legal documents in her hand...unlike some unlucky candidates. To me, the day sounded awful (doing it in the UK...more thank once...was bad enough! )...and I think I may have either walked out, cried or killed some unlucky person. But, now, like me, she enjoys her drives in the valleys with her music turned up loud! I still need to get my Florida license. I can drive here on a Brit license but the insurance rates are huge. Jenny-thanks for following. I look forward to checking out your blog! Paul- I can only use my International Driving License for so long now that I am a resident. I thought there may be a time limit in the states too...no? Nikki-I'm glad you can have a little trip down memory lane here then! Welcome!